For the second time this season, the Bishop Miege Stags and De Soto Wildcats will meet as the top two teams in the state. 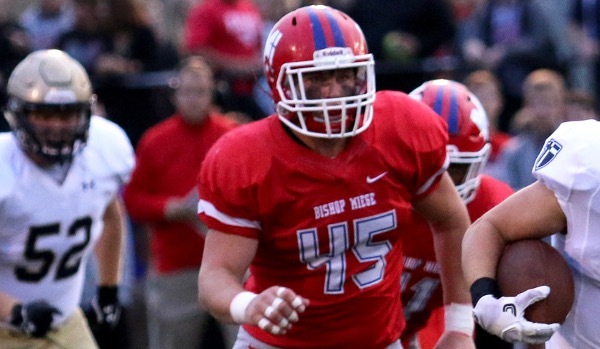 In the first meeting, Bishop Miege prevailed 31-0 in district play. This time, the matchup will be in the Class 4A Division I semifinals with the winner set to meet the winner of Andale and McPherson in next week’s state championship game at the Hummer Sports Complex in Topeka. The three-time defending state champion Stags enter on a 23-game winning streak. Miege finished 6-0 in an extremely competitive Eastern Kansas League that features all of the East semifinal teams in 5A and 6A. The Stags have faced little to no trouble once they started competition against other 4A D-I schools, winning those five games by a combined score of 283-49. Last week, Miege earned a 69-23 win over Labette County. Carter Putz threw five touchdowns, and the Stags led 69-7 at halftime. On the season, Putz has completed 76 percent of his passes for 2,275 yards and 31 touchdowns. He already owns the state’s career touchdown record with 117, and needs just 135 more yards to become the state’s career leader in passing yards. Sophomore Brison Cobbins has rushed for more than 1,000 yards, and sophomore Daniel Jackson has more than 1,000 receiving yards. The Stags are directed by Jon Holmes, who is 64-10 in his sixth season as head coach. De Soto has been dominant outside of the loss to Miege. In the Wildcats’ other 10 games, they’ve posted four shutouts and not allowed more than 14 points in a game. Last week, De Soto topped Fort Scott 49-13. Quarterback Bryce Mohl passed for 180 yards and four touchdowns in the win. Mohl has passed for more than 1,100 yards on the season. De Soto’s Brian King is in his fifth season as a head coach, earning a record of 26-23. In the first meeting, Miege led 10-0 late in the second quarter before Putz broke a 73-yard touchdown run. The game remained 17-0 until the fourth quarter when Daniel Jackson hauled in two of his three touchdown receptions on the night. Two longtime assistant coaches have led Andale and McPherson on the cusp of the state championship. Andale coach Dylan Schmidt took over for legendary Gary O’Hair after a rare first-round early-round playoff loss last season when McPherson defeated the Indians, 21-20, on a game-winning field goal from Drew Labertew. Second-year McPherson coach Jace Pavlovich, formerly the defensive coordinator under Hall-of-Famer Tom Young, has improved off an 8-3 mark in his first season. McPherson is into the semifinals for the third time in school history, joining ’87 and ’08. The Bullpups have never made a state championship game in school annals. Andale won three crowns, all under O’Hair, in ’06-07 and ’14. The Indians have now reached the semifinals six times. Both squads have dominant defenses. Andale and Bishop Miege are the only two 11-0 teams, while McPherson stands at 10-1. The Bullpups fell 9-0 to Maize South in Week 2, and then avenged the loss last week. Andale has a total margin of 491-87 and ranks second in offense (to Miege) and second in defense (to McPherson). The Bullpups are at 395-84. Last year, in an 8-2 season, Andale was at 443-203. For McPherson, junior Kyler Hoppes is at 133 of 207 passing for 1,669 yards with a 22/5 TD/INT ratio. Junior Jace Kinnamon has emerged a standout running back with 181 carries for 1,019 yards and 15 scores. McPherson has 13 turnovers and is plus-10 in turnover margin. The Bullpups have averaged 6.1 yards per play. Senior Jayse Alexander leads the defense with 92 tackles, and is second with 15 for loss. Senior Wyatt Seidl has recorded a team-high 16 TFLs. Andale has defeated Wamego, 64-13, and Andover Central, 40-10, in the playoffs. McPherson held off Buhler, 15-14, in overtime on a memorable two-point conversion. Last week, the Bullpups beat Maize South, 28-7. Andale, which opened the season with a seven-point win against Andover Central, scored the game’s first 40 points last week, including scores on its first four possessions. Senior running back Andrew Mohr, junior all-purpose threat Sawyer Simon and junior quarterback Ethan Baalmann have led the offense. Senior Parker Bruce had a key interception to set up a short field. Simon paced the Indians with 19 carries, 70 rushing yards and two scores, along with a big kickoff to start the game and an early receiving TD. This is the sixth straight season the teams have matched up with Andale holding a 3-2 advantage. McPherson’s two wins have come by a collective six points. This is another close one.